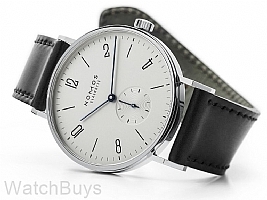 The Nomos Tangente features a movement which begins with a traditional Glashutte 3/4 plate which is rhodium plated and decorated with Glashutte ribbing and Langeleist perlage. This watch is extremely comfortable to wear thanks to its uniquely designed lugs. Be sure to expand the picture above, and you will be able to see the curved pattern in the lugs which causes the watch to mold to the wrist, and creates a length of 44 mm lug end to lug end. Beautiful silver plated dial with a combination of Arabic and hour markings. The dial contains an off-center subsidiary seconds dial. The dial is first sand blasted, then bathed in silver to provide the unique Nomos coloring. The baton hands are made of polished steel and then flame blued. Sapphire crystal on front and back. Verified Owner Comments: The long lugs make this watch seem a little larger than the case size would suggest, but it fits my 7 3/8 wrist well. I really like the design of the dial and the transparent caseback. The watch is a little more on the dressy side in my opinion (though to me dressy means a 2-piece suit) so I don't wear it every day, but do enjoy wearing it and look forward to having it for many years). Verified Owner Comments: I recently bought this watch and am really pleased with it. The craftsmanship is impeccable and the watch is very beautiful in a minimalist way. Highly recommend. This was my first "proper" watch, and could not be more enthusiastic about this model and about what Nomos is doing in the horological world.